mdesk™ Orthopaedics is a high-performance, cost-effective system that allows you, the orthopedic surgeon, to optimize your skills and maximize the quality and efficiency of surgery. 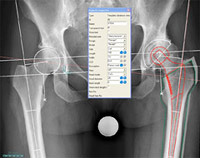 With mdesk™ Orthopaedics, preoperative templating of joint replacement, trauma, and deformity correction surgery becomes easier and more valuable than ever before. mdesk™ Orthopaedics has evolved into a highly sophisticated yet easy-to-use system thanks to our close collaboration with some of the most highly respected orthopedic clinics and professionals in the global orthopedic community. With over 300 installations worldwide, mdesk™ is the reliable and proven solution orthopedic surgeons have been waiting for.